Growing up in western Texas as the daughter of cotton sharecroppers, I spent my summers weeding cotton, five days a week, 10 hours a day, in 95-degree heat. As grueling as this workload was, others had it even worse. For foreign workers toiling as “guest workers” (or “braceros”) alongside us in the cotton fields, the five-day workweek was an impossible luxury. They were often stiffed on wages, and health care was simply nonexistent. Viewing them as units of production, employers worked them to their limit, knowing that the following season a fresh unsuspecting batch would arrive. The horrific abuses suffered by workers in programs such as the bracero program are well documented and indisputable. And although most people like to think of bracero programs as a phenomenon of the past, the reality is that their legacy of exploitation and abuse continues to thrive in contemporary American society through modern guest worker programs such as the H2-A and H2-B. Like undocumented workers, “guest workers” in this country face enormous obstacles in enforcing their labor rights. The H-2 guest worker programs bring in agricultural and other seasonal workers to pick crops, do construction and work in the seafood industry, among other jobs. Workers typically borrow large amounts of money to pay travel expenses, fees and even bribes to recruiters. That means that before they even begin to work, they are indebted. According to a new study published by the Southern Poverty Law Center, it is not unusual for a Guatemalan worker to pay more than $2,500 in fees to obtain a seasonal guest worker position, about a year’s worth of income in Guatemala. And Thai workers have been known to pay as much as $10,000 for the chance to harvest crops in the orchards of the Pacific Northwest. Interest rates on the loans are sometimes as high as 20 percent a month. Homes and vehicles are required collateral. Handcuffed by their debt and bound to employers who can send them home on a whim, the “guests” are forced to remain and work for employers even when their pay and working conditions are second-rate, hazardous or abusive. Hungry children inevitably trump protest. Technically, these programs include some legal protections, but in reality, those protections exist mostly on paper. Government enforcement is almost nonexistent. Private attorneys refuse to take cases, and language barriers make it virtually impossible for workers to speak out. Undocumented immigrants face similar obstacles at work. Because they are under the constant threat of deportation, they cannot effectively assert their rights at the workplace, and employers routinely take advantage of them. The result is that both guest workers and undocumented workers end up working the most dangerous and most exploitative jobs in our country. It’s getting worse, not better. Among foreign-born workers, workplace fatalities increased by an alarming 46 percent between 1992 and 2002. Since 1992, fatalities among Hispanic workers have increased by 65 percent. When immigrant workers try to correct such injustices by forming unions, they are cruelly harassed, intimidated and even terminated for their actions. When all else fails to break a union drive, employers simply call in the immigration authorities and everyone gets deported for standing up for basic human rights. For years, the AFL-CIO has campaigned for an end to the exploitation and abuse of immigrant workers who are here working hard and contributing to our economy. The best way to guarantee the wages and rights of all workers in this country is to give every immigrant the opportunity to become a citizen, with all the rights and duties that entails. The exploitation of immigrant workers hurts us all. When standards are driven down for some workers, they are driven down for all workers. For this same reason, guest worker programs must by squarely rejected. Because workers in these programs are always dependent on their host employers for both for their livelihoods and legal status, these programs create a disenfranchised underclass of workers. History, economics and common sense dictate that exploitation of workers will continue as long as it makes economic sense for employers to do so. We must step outside of the status quo and revise the current immigration law in a way that guarantees full labor rights for future foreign workers and reflects real labor market conditions by restructuring the current permanent employment visa category. That is, future foreign workers should be welcomed as permanent residents with full rights at the onset — not as disposable “guests.” This is the only way to guarantee that foreign workers enjoy the same rights and protections as all other U.S. workers, including the freedom to form unions and bargain for a better life. As a nation that prides itself on fair treatment and equality, how can we possibly settle for anything less? Linda Chavez-Thompson is the executive vice president of the AFL-CIO, representing 10 million workers. She is the highest-ranking woman and Latina in that labor federation. The above commentary written by her appeared on the AFL-CIO web site June 6 and in a recent issue of Forbes Magazine. David Bacon (dbacon @igc.org) is a labor journalist and photographer who lives in the Bay Area of California. 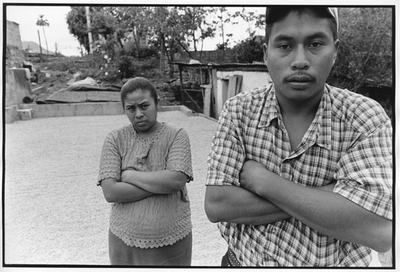 His photos (and related quotations) are taken from his book “Communities Without Borders: Images and Voices from the World of Migration,” published by Cornell University/ILR Press.